Russian Foreign Minister accuses Ukraine of allowing 'extremists' to orchestrate events in Donetsk. Russian Foreign Minister Sergei Lavrov accused Ukraine of breaking the Geneva Accords Monday, in the latest set of hostile barbs between Moscow and Kiev. 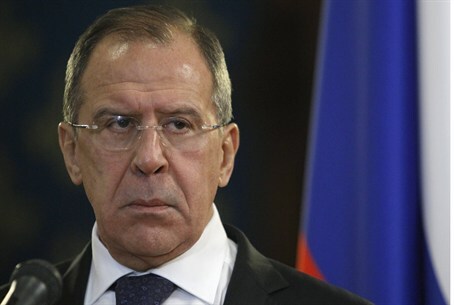 Lavrov accused the new government, which was established last month after a coup by pro-European protestors, of not weeding out extremists during the recent revolution. "Extremists are calling the tune," he alleged, condemning a fatal shooting near Slaviansk, in eastern Ukraine. He also condemned renewed protests in Kiev's Maidan (Independence) Square, calling the government's inaction "absolutely unacceptable." The accusation was levied in the midst of attempts to "de-escalate" the crisis in Ukraine, which has seen waves of pro-Russian demonstrations turn violent in the Donetsk province over the past month. The protests, which follow a controversial referendum vote and annexation of the Crimean peninsula, have led to the dramatic takeover of several government buildings in several cities, including Slaviansk, Luhansk, and Donetsk. On Sunday, several protestors were killed in Slaviansk under unclear circumstances. Lavrov claims that the deaths - which occurred after an April 17 Geneva Accord by the US, the European Union, and Russia to immediately end violence in eastern Ukraine - have violated the terms of the last-ditch agreement. Moscow has repeatedly leveled allegations of anti-Semitism at the authorities in Kiev, accusing them of being controlled by far-right groups that played a prominent role in protests to oust Kremlin-backed president Viktor Yanukovych. The unrest in Ukraine has brought with it a rise in anti-Semitic attacks on the region's Jewish population, highlighted by such events as the stabbing of the Deputy Commander of ZAKA Kiev and Hatzalah Kiev Chairman Rabbi Hillel Cohen. Just this week, two more prominent anti-Semitic incidents made headlines, after Nazi-esque leaflets were allegedly distributed asking Jews to "register their religion" and a Ukrainian synagogue was firebombed.